A few months ago, my now-husband and I were involved in helping to organize the United for Marriage rallies at the Supreme Court. 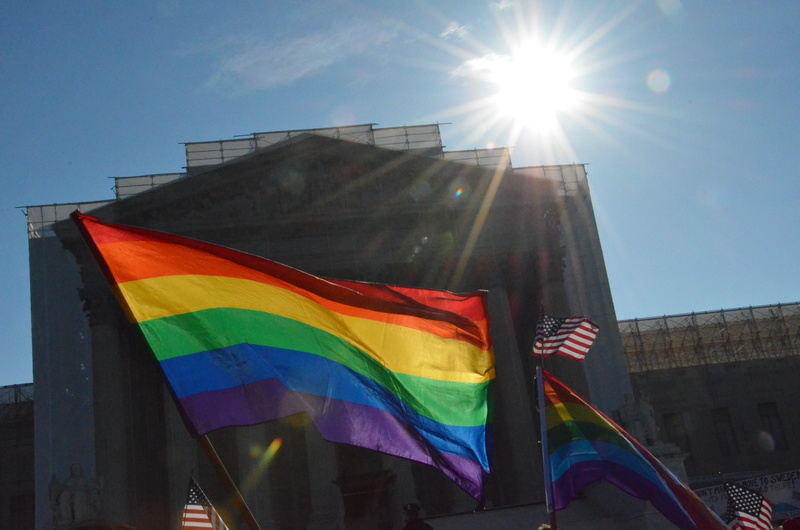 Our events, in support of equality for all Americans brought thousands to the steps of the highest court in the land and brought together over 150 different organizations in solidarity. The first day of the rally, the virulently anti-gay group, The National Organization for Marriage had scheduled a rally to fight marriage equality. 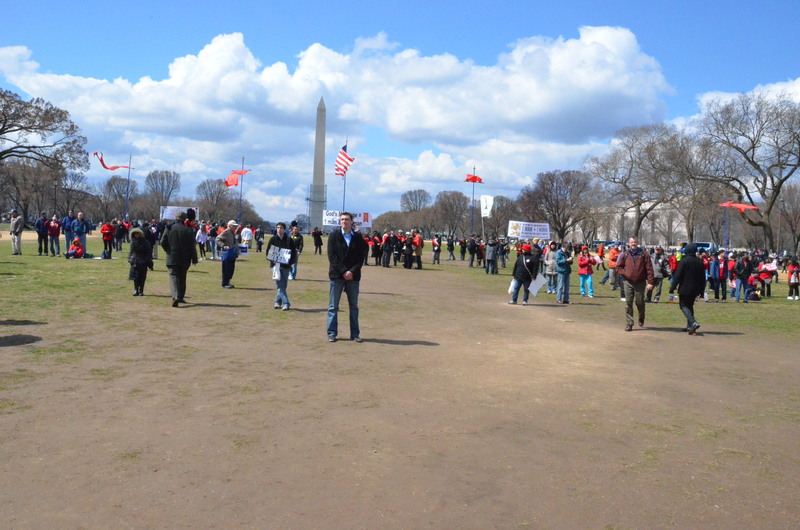 Their (sparsely-attended) rally was a topic of much discussion leading up to the events. In working with GoodAsYou.org’s Jeremy Hooper, we immediately went on the lookout to find out just what they were planning. Jeremy did some incredible work to research the musicians slated to perform at the anti-gay event. One group backed out nearly immediately after being informed of NOM’s history and the truth behind their work. Another group, a band named “Ultramontane” was nowhere to be found. 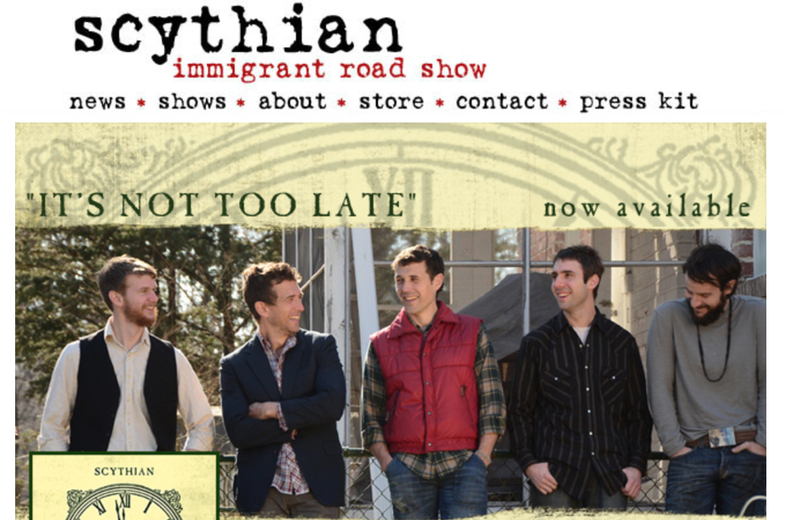 After some further research, we discovered “Ultramontane” was actually just 3 out of the 5 members of the band, Scythian. As we reported on this and as Scythian quickly removed all their online properties and social media to avoid the frustration of equality-minded fans, the two musicians who’d decided not to take part were left to deal with all the questions. To this day, 2 months later, the three bandmates who refused to do so much as state why they’d decided to support a hate group, have yet to make a public statement. In the meantime, Josef Crosby and Andrew Toy have publicly and eloquently stated their support for equality. The band is now back together after taking a bit of a hiatus while this all “blew over.” A rogue fan group upset about the band member’s actions started their own Facebook group. Many who belong to the group are also volunteers for the band’s “Street Team,” selling t-shirts and such at concerts. “First of all, we wanted to let you know that we did not play the March for Marriage. Though still firm in our stance on traditional marriage, based in our deeply held faith as Catholics, upon researching the event, we decided that we did not want to be involved given its highly politically charged nature. Admittedly, there was some naivete involved on our part in accepting to play, and this was all a learning experience for us. Those of you who civilly disagreed with our stance, we thank you for the respect you accorded us. You are true ambassadors of peace and much needed in this world. And we thank those who have respectfully shown support for us and assured us of their prayers. We must say that we were deeply saddened by the ugly nature of the attacks leveled at us for expressing our convictions. We were especially alarmed when members of our family fell under these vicious attacks, wherein they were disparaged for their stance and wherein their personal information was disseminated. For this reason, as you might imagine, we were left with no choice but to shut down the main band page as we could not control what was posted. We choose not to respond in kind, and offer our prayers for those people, confident in the hope that love conquers, indeed has conquered all. We can’t help but believe that most of the ugly posts were not made by Scythian fans but by outsiders. As far as the street team group goes, we wanted to address some of you who felt hurt in the past weeks. Due to the ugliness encountered, the band members stepped away entirely from the medium of Facebook, very much shaken by the ugliness that can be encountered through it. In the weeks since the turn of events, all administrative activity was taken care of by our friend and assistant. If some of you felt marginalized, we sincerely apologize. If there was any offense taken at her actions, please understand that she was in a difficult position, with no playbook in hand, and that if she erred, her actions were motivated from a place of protecting us. She too was shaken by what happened on the main page. We ask you for your understanding and forgiveness. Keep in mind this message was not sent to fans, but to volunteers they need to help promote their shows and sell their merch. The band has yet to actually publicly address why they chose to align themselves with an anti-gay hate group. Categories Brian Brown, National Organization for Marriage, Scythian, Ultramontane, Washington D.C.
On Saturday, May 18th I had the pleasure of marrying my best friend. 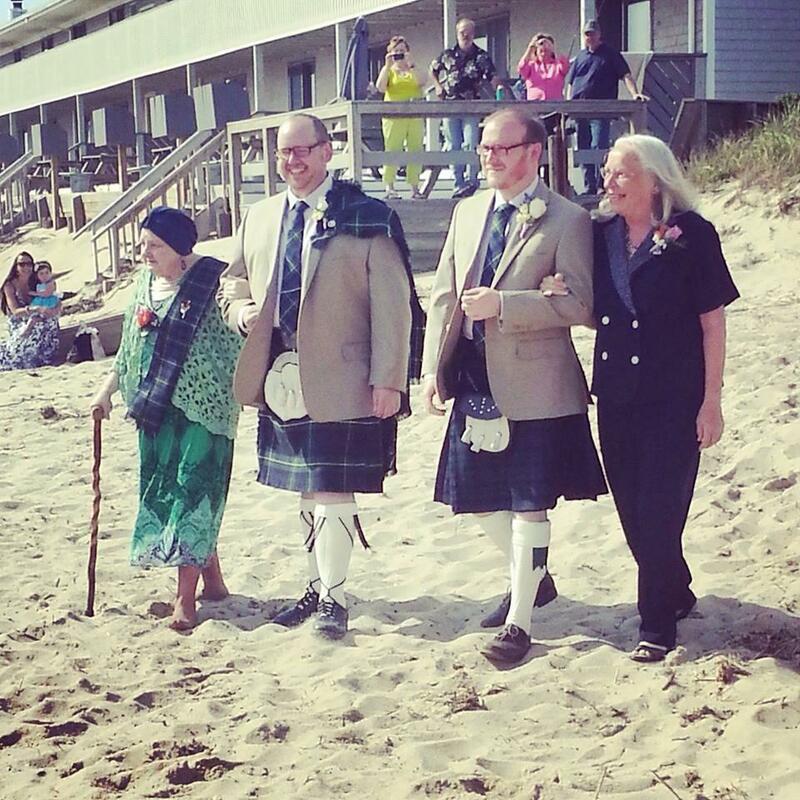 In front of a hundred or so dear friends and family on a beach in Provincetown, MA., I did something I never ever imagined I’d be able to do legally in this country. 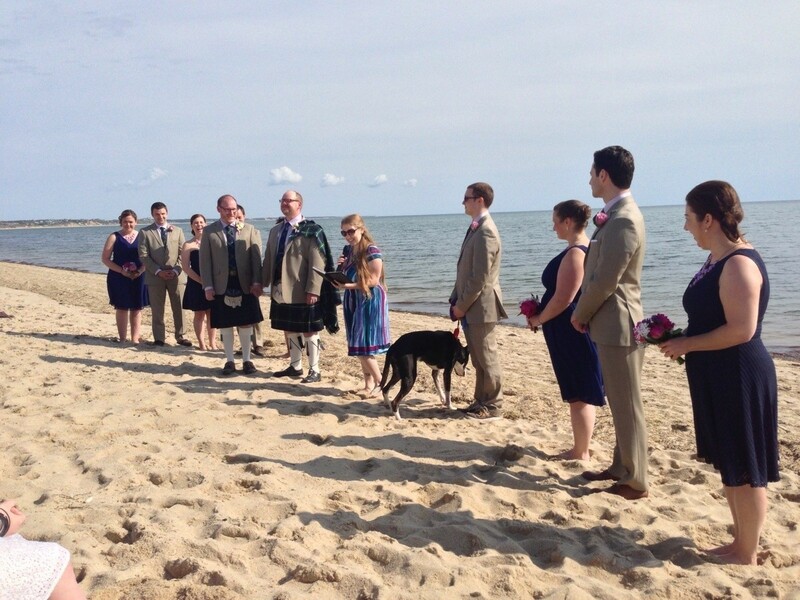 The ceremony, led by my my dear friend from high school, Shannon – was everything I’d hoped it would be. We started planning with the idea that we could subtly include some purpose – a few readings by LGBT writers, maybe a casual mention of marriage equality since that’s the work both of us do. Let’s just say subtlety has never been either of our best qualities. Who could stay silent when you discover you’re getting married on the 43rd anniversary of the first gay marriage ever performed in the US? Or that you’re getting married on the 9th anniversary of the first state legalizing marriage equality – and you’re getting married in that state?! Casual mentions plus a reading of Harvey Milk’s “Hope” speech and a request of our guests that they throw fabulous parties when marriage equality becomes federal law made for quite the purpose-driven wedding ceremony. 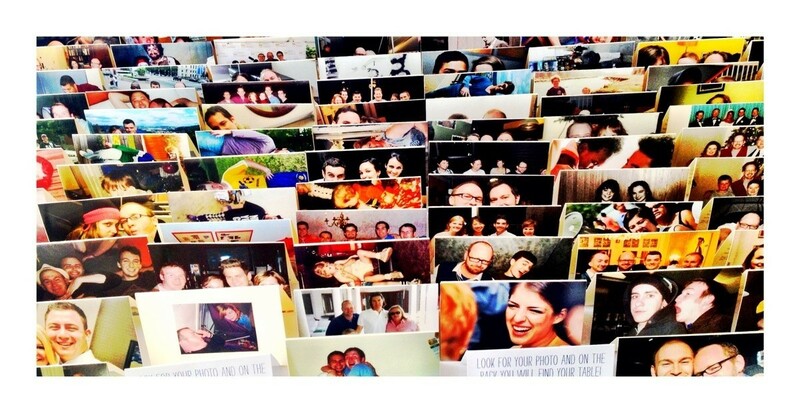 Our place cards – everyone had to find their photo! On to the reception and we did something fun – instead of place cards, we found photos of nearly everyone in attendance. Since I’m a photographer and pictures are a big part of my life, it felt appropriate. People had to look for their photo to find out what table they were seated at. Then came the tables. Each one was named after an LGBT hero or heroine and featured at the centerpiece, a large photo on one side and a brief bio on the other. It was important to us both that we recognize all those who’ve worked so hard before us to make what we were doing, possible. 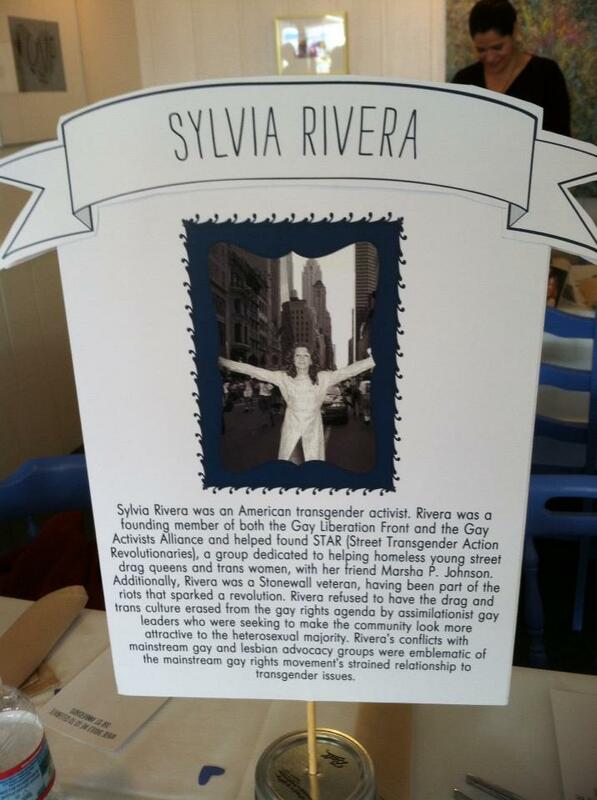 The “Sylvia Rivera” table, honoring the transgender activist and Stonewall veteran. 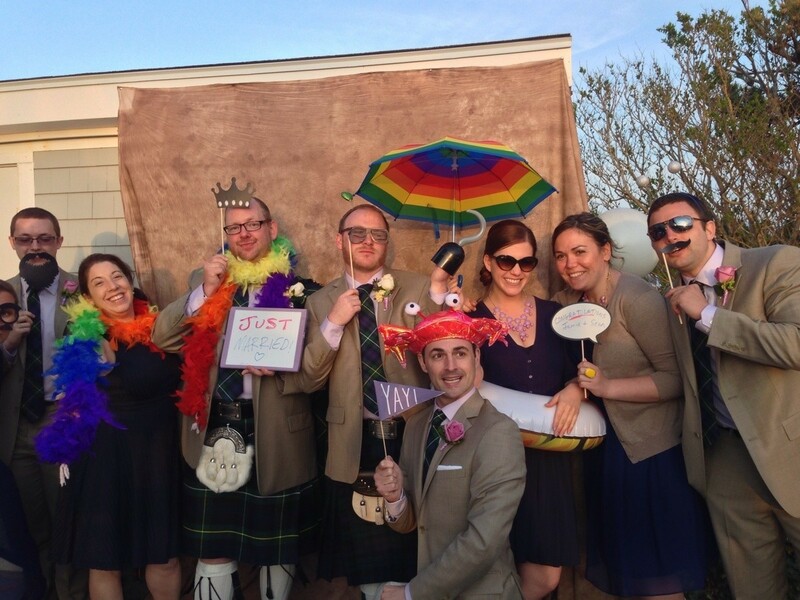 And of course, who doesn’t have a photo booth at their wedding nowadays? We just set up a simple backdrop and provided a trunk full of horrifically gay props including a rainbow umbrella, rainbow boas, mustaches, glasses, crowns and a blow-up rainbow unicorn. And if all that wasn’t enough, moments after announcing on Facebook that I’d become engaged, my high school senior class president messaged me saying she wanted to make our cake. She’d started a small business making cakes and as you can see, she was incredible. Her company, Devilish Desserts, is clearly not one of those to avoid while planning a gay wedding! Following dinner, we all went to the Wave Bar in downtown Provincetown where our very straight family and friends danced the night away with hundreds of lesbians and a few drag queens (it was single women’s weekend). We even met a lovely lesbian couple who got married the same day! 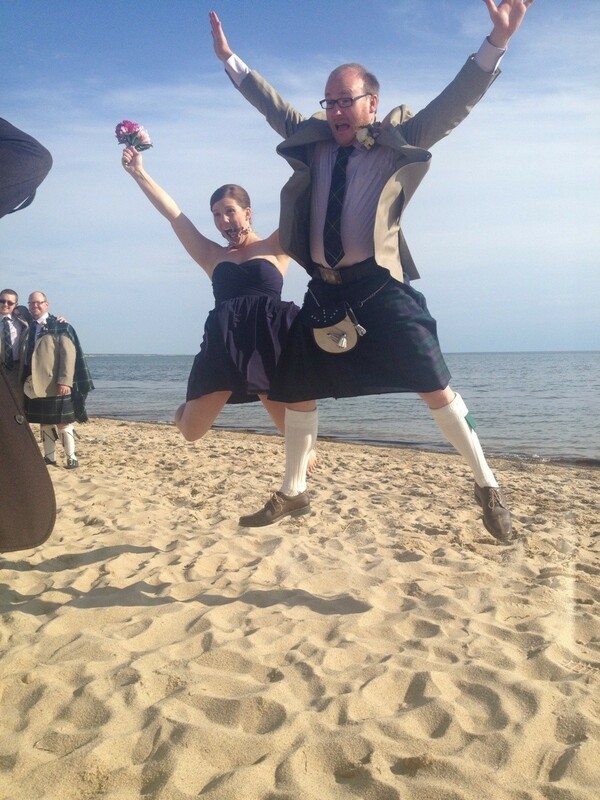 A huge thank you to all of you who helped with contributions to help make our big day possible! Taking advantage of our makeshift photobooth! Overall, it was a marvelous day filled with tons of love and at the end of the day, Sean and I share a favorite memory – in the middle of the ceremony, Shannon asked everyone to be silent for a moment as they considered the vows we’d made and how they could support us in our new life together. And for a moment, after a week of hustle and bustle and frantically organizing the wedding, after driving 10 hours, dealing with family and everything in between, for one moment all you could hear was the gentle lapping of the waves over the sand. Simple, beautiful, and perfect. Before our family and friends, and especially Eli, I take you Sean, to spend my days and nights with. To love you and to like you, to hold you tight when either of us need it and to give you the room you need to grow as we do so together. I promise to build our family in a way that honors our past and strengthens the future for those who come after us. I promise to continue to laugh with you, cry with you and continue posting photos of you an Eli sleeping on the internet. And this above all, as our lives blossom together and the winds take us in new directions, I promise to call any place you are, my home. I promise to be patient, to listen, and to remember that you’re usually right. I promise to cheer you on when you’re doing great things and hold your hand through hard times. I promise to make you laugh when you’d rather not, to make you slow down every now and then and live in the moment, and when I’m so very very mad at you to remember that we’re a team. I promise to teach you how to drive if you’ll teach me how to swim, and to make you turn off Facebook sometimes. I promise that no matter what comes next for us that we will face it together. Because without you I would be completely lost. More than anything, I promise to love you. And when you’re old and wise and boring I’ll be right there too – maybe a little less wise, and I will love you still. 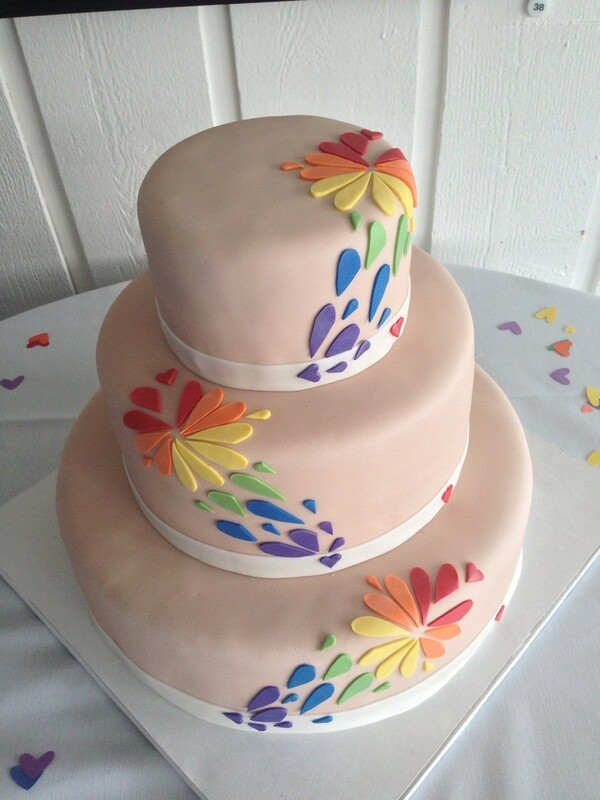 Our cake, designed by Devilish Desserts – the inside was rainbow layer cake! Our first dance – there was a technical malfunction, so the whole crowd sang “Rainbow Connection” a cappella and we danced. 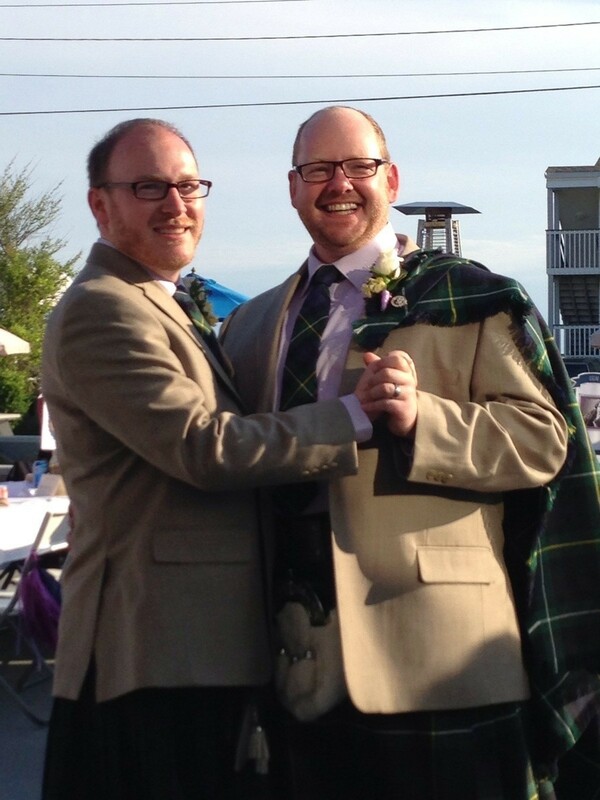 After many arguments over clothing, Sean surprised me by showing up in a kilt like mine. 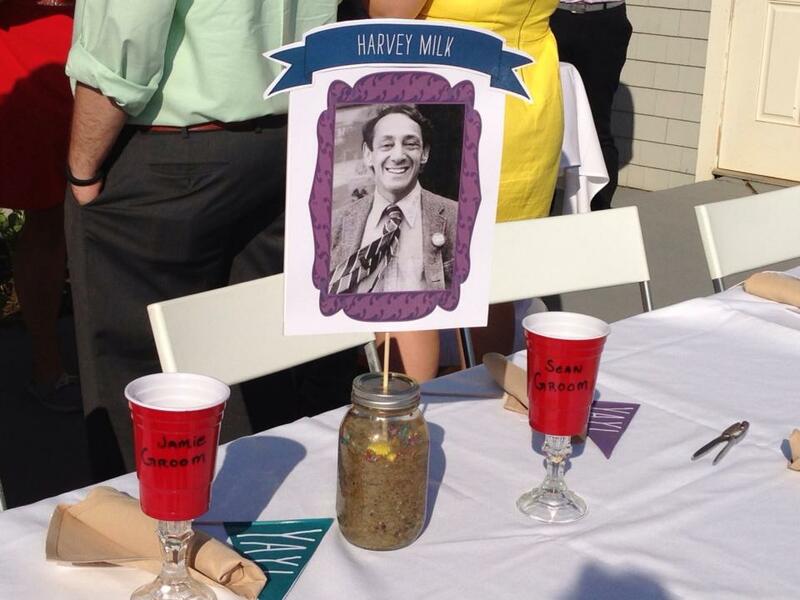 The head table was of course – the Harvey Milk table! After NBA player Jason Collins came out this week, there was a flood of support for his courageous move. Everyone from his family members to President Barack Obama and the First Lady publicly showed their support. Of course there were the detractors as there always are, but they were most definitely in the minority. Breitbart blogger Ben Shapiro showed his bigotry by claiming it was no big deal that Collins came out. Shapiro found himself on the same side as the Westboro Baptist Church when they announced they’d picket his games. And right on cue, a church in Wisconsin has shown their true (intolerant and ignorant) colors. 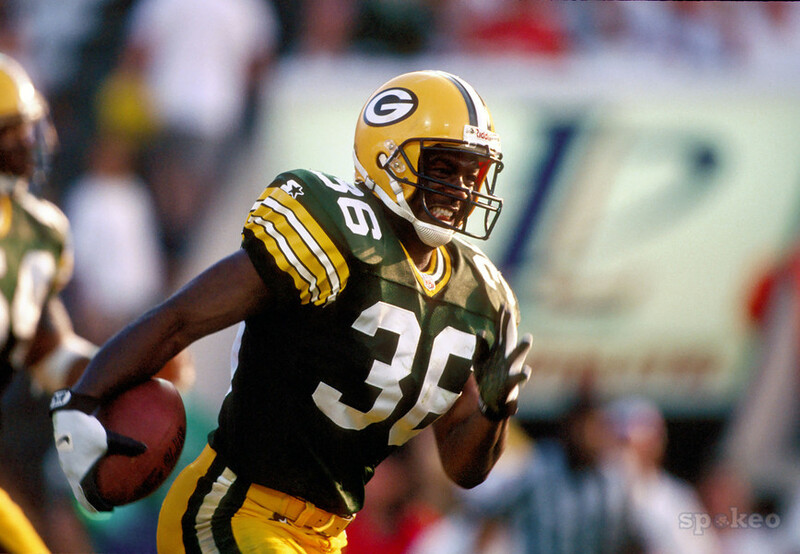 Former Green Bay Packers safety Leroy Butler was scheduled to speak at a Wisconsin area church, but when that church found out he tweeted four words this week “Congrats to Jason Collins,” they cancelled his appearance. Butler took to Twitter to tell the story.